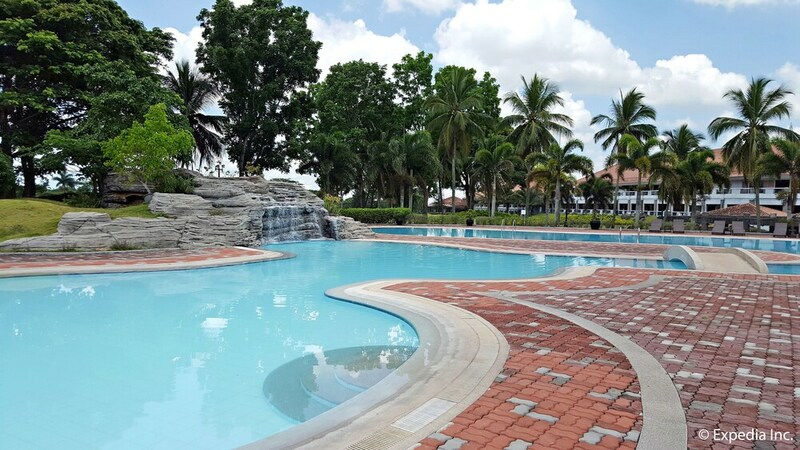 This family-friendly Lipa resort is located in the mountains, within 3 mi (5 km) of Mount Malarayat Golf and Country Club and San Sebastian Cathedral. SM City Lipa and The Mabini Academy are also within 6 miles (10 km). Along with a full-service spa, this resort has a golf course and a restaurant. WiFi in public areas is free. Other amenities include an outdoor pool, a fitness centre and a bar/lounge. All rooms are individually furnished and offer room service and free bottled water. For a bit of entertainment, TVs come with cable channels, and guests can also appreciate conveniences like fridges and coffee makers. In addition to a full-service spa, The Suites at Mount Malarayat features a golf course and indoor tennis courts. The resort offers a restaurant. A bar/lounge is on site where guests can unwind with a drink. A computer station is located on-site and wireless Internet access is complimentary. This 3-star property offers access to a business centre. This family-friendly resort also offers an outdoor pool, a kid's pool and a hot tub. For a surcharge, the property provides a round-trip airport shuttle (available on request) and a beach shuttle. The Suites at Mount Malarayat has designated areas for smoking. Full breakfasts are available for a surcharge and are served each morning between 6 AM and 10 AM. The Arirang Restaurant – Overlooking the golf course, this restaurant specialises in Korean cuisine. The Sand Trap Lounge – This bar overlooks the golf course and specialises in Filipino cuisine. Start your morning with a full breakfast, available each day from 6 AM to 10 AM for a surcharge. You can order a meal from room service during limited hours. Guests can play rounds at the 27-hole golf course and enjoy other recreation facilities including indoor tennis courts. An outdoor pool, a children's pool and a spa tub are on site. Other recreational amenities include a sauna and a fitness centre. Guests aged under 18 years old are not allowed in the swimming pool, health club, fitness facility or spa tub. Guests can indulge in a pampering treatment at the resort's full-service spa, The Amir Spa. Services include massages. Rollaway/extra beds are available for PHP 1000.0 per night. Cribs (infant beds) are available for PHP 150.0 per night. This property enforces a casual dress code in the lounge and restaurant area. For more details, please contact the property using the information on the reservation confirmation received after booking. This property's policy is to refuse certain bookings for the purpose of group events or parties, including pre-wedding stag/bachelor and hen/bachelorette parties. Reservations are required for golf tee times. Reservations can be made by contacting the resort prior to arrival, using the contact information on the booking confirmation. Construction is underway at a neighbouring building and there may be noise disturbance from the construction work. This is an Expedia Rate property. Sorry, we seem to have had an issue loading our review content. Try again?